Sorry, I'm just so swamped with work right now, can't even find the time to post anything new. So, in the meantime, I'm going to pull out some cool shots I've taken around our beautiful world. Here's the Library of Celsus at Ephesus. I took this on a trip to Turkey in 2001. 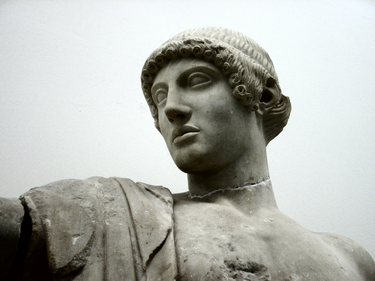 Apollo (Aπόλλων), the son of Zeus and Leto, brother of the huntress Artemis (they're paternal twins). (I took this in the museum at Delphi). Click the pic for the large view. It's not just for genre writers, establishing new worlds, unearthly conflicts, alien flora and fauna--even hissing fauna (I'm an Of Montreal fan). I have seen Jodi Picoult speak twice, once in Exeter for her launch of Nineteen Minutes, and once in New York at a writer's conference, and although she did a reading for the launch, her primary focus was on the research she had to do for her books. (She's a great speaker). I love the research part of writing, the creation of worlds, magic systems, political structures. But what about the form these take? Do you write notes, just stating the facts? Have you tried other methods, like writing fictional accounts, diaries, newspaper articles? As a writer, one obvious path to take is to write about the world from the viewpoint of an author in that world, an observer, and these fictional out-of-story helpers can become characters in themselves, characters that will help you write your story. It just occurred to me that one interesting way to explore the world would be through the diary of someone young or very old, through their eyes. Same world, different perspectives--always keeping in mind that the purpose of world building and all this research is not to dump it on the reader, but to make you the writer so comfortable in your world that it becomes second nature to tell stories about what goes on inside it. (That's rule number 1 of world building, BTW. It's for you, not the reader). For Nanowhere--an old novel of mine I gave away under a CC license, I wrote several drafts of a scientific article establishing the theory that self-awareness in humans is the result of two separate conscious faculties in hierarchical order, one outward facing and one that was inward facing (conscious of, or managing the first conscious faculty). I posted the papers and collateral material here if you're interested. (I wrote them. The authors listed on the papers are characters from the story). 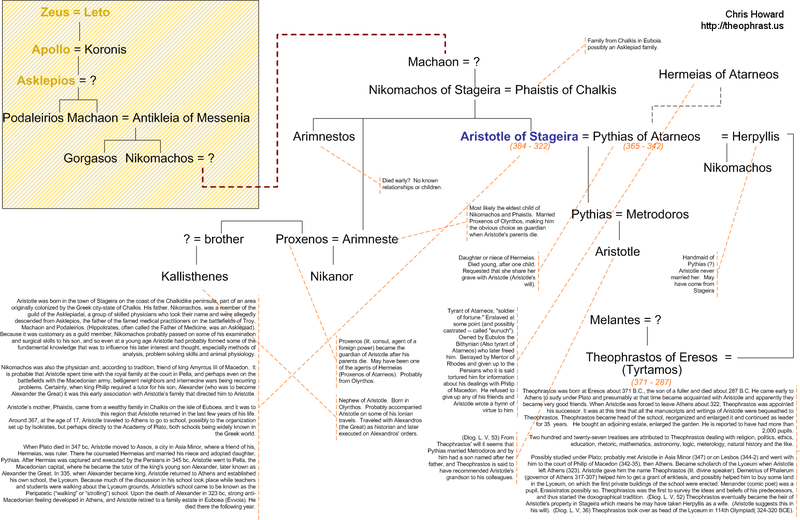 I sort of stumbled into this post idea this morning when I was looking for Visio on my notebook and found an old family tree I did of Aristotle (The Philosopher) for a novel I will get back to when I'm done with my current WIP, The New Sirens. That's the other cool side of research, is that we writers do so much of it that it piles up after a while, and we forget about some of the crazy and cool things we did to dig into some particular world in the first place. 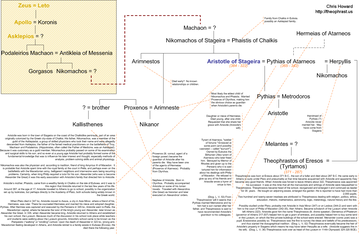 Here's my Aristotelian family tree with notes and even a dashed line back to Zeus, which was popular in those days (click the pic to see it larger). If you're interested in the Visio format or SVG, let me know (email at bottom of right column). Writers look into your futurescopes and tell me what you see? Where do you see yourself in five years? Another two, three, four novels completed, a whole new series, short stories, anthologies, awards, movie options or whole movies made from your stories and premiered by then? Do you see yourself entering new genres or focusing only on one? Agent changes, publisher changes? Any unexpected turns in your writing career? Where will you be as an author in five years? I have to think about this myself. I'll follow up with a post on where I think I'm going. Study the moon in ancient Athens. Here's my entry for this week's Illustration Friday topic: moon. 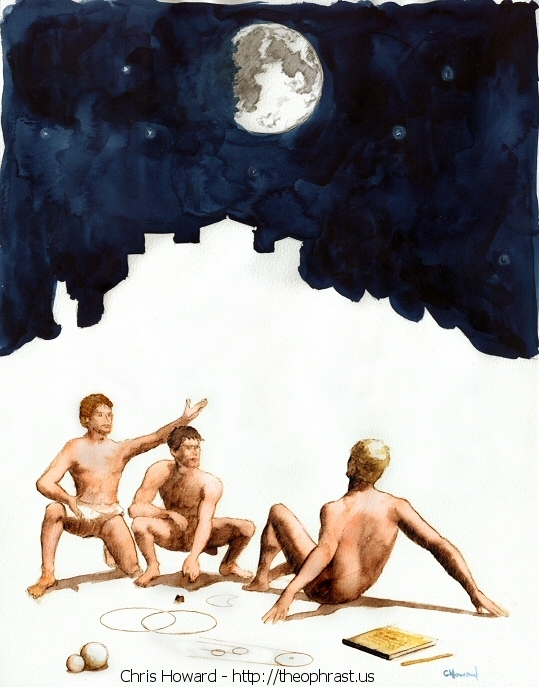 Three Athenian gentleman trying to settle an argument over what causes the shadow on the moon. Is it the earth blocking the rays of Helios? I thought it would be cool to knock out the Acropolis with the centered temple of Athena Parthenos against the night sky. Not really sure if I pulled it off. Watercolor on 300# hotpressed. Detail view below. Click the pics to see them larger. 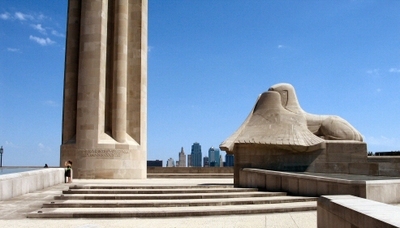 My dad and I spent an hour Saturday morning walking up the hill from the Crown Center in Kansas City to the Liberty Memorial, a big neo-classical structure with a 217 foot tower. There's a wonderful World War One museum inside, full of stories and uniforms, land and sea weapons, interactive touch boards that explain political events, how machine guns work, and a lot more. If you're ever in the area, I definitely recommend taking the time to walk through the museum. Jul 9, 2007 3:13:40 PM | Cool, history, Interesting..., Library, Wow!